You mounted your new 4K OLED TV on the wall. The amazing speakers you bought are placed strategically on tables or the floor around the TV. Your Netflix subscription is up to date, and you’ve got a brand new Blu-ray Disc player. You somehow ran wires and hid them in a cabinet. You rearranged your furniture, bought some dark curtains, and now you’re set for movie-theater quality viewing. Did you know setting up and installing a home theater or media room is more complicated than the DIY manuals let on? Creating the right home theater involves many elements that must work together to provide a seamless entertainment experience. -Your TV will not turn on. Everything is connected, popcorn is popped, but nothing happens. -The TV turns on, but the picture stinks. Bad connection? Bad cable wire? Who knows. -You turn on your Blu-ray Disc player but it isn’t working. Hmmm. Is your HDMI connection shaking hands with your TV? -The surround sound isn’t even making a semicircle. What the heck? -Netflix streaming just isn’t happening. But you were so ready to catch up on Breaking Bad! You want to check that everything is connected properly, and plugged in, but…um yeah. You know those wires that you tucked into a cabinet? They’re a bit of a bird’s nest now because they really weren’t fitting easily, so you just pushed them in. Now, you’ve got to first detangle them to check if all of the connections are sound. The thing is, if you want a home media experience that will truly enhance your electronic lifestyle and provide hours of entertainment pleasure, it’s best to have a professional A/V company install the system. I know what you’re thinking—money, money, money. 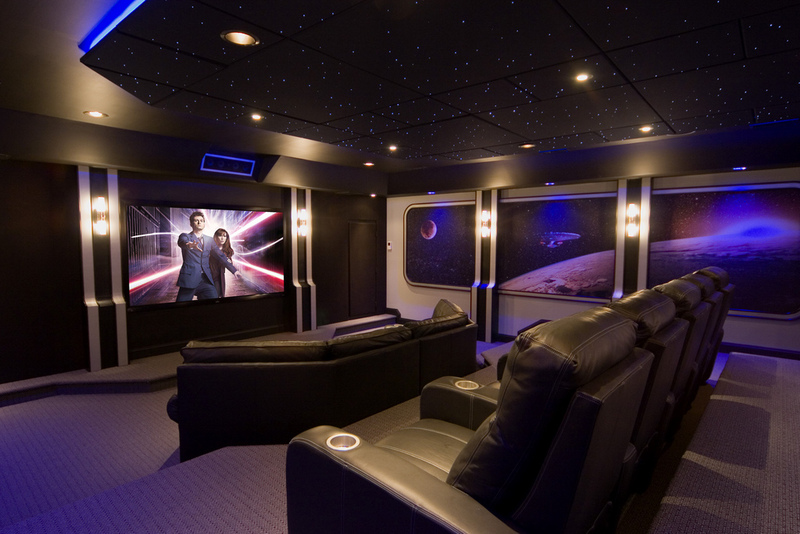 To be sure, some home theaters can run into costing big bucks. But many don’t. There are systems and products available to fit a variety of budgets. Remember to also consider the costs of going to the movies today—tickets to theaters with leather recliners, food service, and 3D movies add up quickly. -First and foremost, professionals are just that. They do this all the time. They are familiar with all home theater technology products from sound to screen and in between. They have access to some products that the general public might not have access to. They will be certain that your system functions—before they leave. Wiring will be done safely and neatly, and will be easily accessible in case of troubleshooting needs. Your components will be housed in a rack that can be hidden from view, but again are easily accessible. Neat, tidy, functional. Enough said. -You will have expert guidance on selecting the right system components for your space, and your lifestyle. OLED TV or projector? Floor speakers or in-ceiling? Do you watch mostly sports or just like to stream? Is there too much light in the room, even with blinds drawn during the day? -The whole project will be finished, and probably far quicker than with a DIY job. There’s no worse feeling than starting a theater project and getting halfway through only to realize you’re in way over your head. Can’t you just see your children’s faces, as their friends are arriving for that mammoth sleepover/theater night? Now you’ve got two costs—the cost to fix what went wrong, and the cost to install the system. -If any parts need to be hardwired, are you qualified to do that work? Electrical wiring moves from ‘oops’ work into genuine risk if done improperly. If you want wires hidden in walls, and neatly housed in one accessible cabinet, this is not a task for the weak of heart. -A professional installer can guide you on furniture choices to optimally enjoy your new system. Moving furniture around to ‘sort of’ face the TV doesn’t cut it. Do you know the best viewing angles and screen heights? Since you and your family will likely be spending much time in this room, you’ll need to be comfortable. -A professional can also introduce you to the world of home automation. All those cool components that make up a mind-numbing theater and sound system all need to be controlled. Can you set them up in one wireless control? -Who will service your system when things go awry or software glitches out? Having a system professionally installed means you have professional service available for those rare times when something isn’t working right. At the end of the day, a home theater is no different than any other products or services you purchase. You get what you pay for. If you’re ready to enhance your electronic lifestyle with a dedicated home theater space, IDS Audio/Video & Technologies can work with your dreams, and your budget, to create an entertainment paradise for you and your family. Contact us today for a complimentary consultation and learn how affordable the home theater you’ve been dreaming about really is!